"Dr. Rob Stoltz has been my good friend and personal physician for the past 15 years. Rob is the most personable, down-to-earth individual you would ever hope to meet. He combines a welcoming personality with a sharp practitioner’s mind and keen intellect. I have complete trust in Rob as a confidante and physician. How much? Well, Rob treats my parents, too. I can think of no better compliment in this era of complex and confusing medicine. "After I met Dr. Stoltz for my initial consultation, there was never a doubt in my mind that I wanted to join his Medical Practice. From the start, he made me feel comfortable, as if he had been treating me for years. We talked in depth about what was on my mind and I never felt rushed. We developed a plan for me to follow for diet, meds and follow up visits. The best thing about the follow up visits, there is never a long wait to get into the exam room. When I have something that just pops up, I call and I can always get a timely appointment. There have been times I have had a question or two and I just call him on his cell phone for the answer. I like the office staff, I like their philosophy and I really like the way Dr. Stoltz practices medicine. It is a great feeling to know my doctor is as close as my phone. If you are looking for a doctor that cares about his patients and is dedicated to his profession, look no further...you have found him. 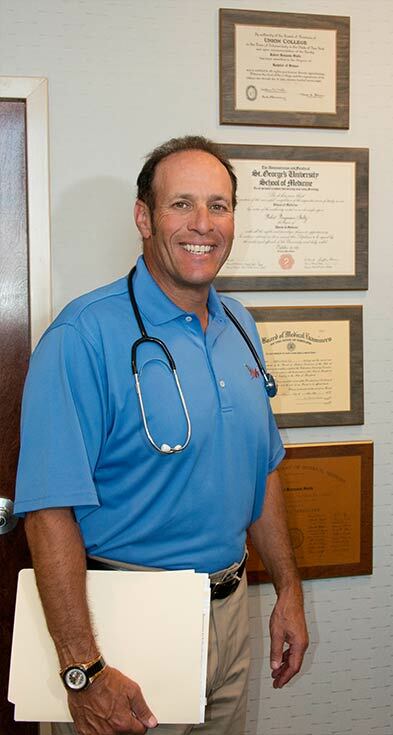 "Dr. Stoltz has been our family physician since he began his medical practice almost 30 years ago. We have the highest regard for him as a professional and as a person. He has never given us reason to doubt his abilities or his character. On the contrary, we respect him enormously as a physician and have developed a deep mutual personal relationship. In a routine physical in 1999, Dr. Stoltz discovered a mild irregularity in my cardiovascular system. Dr Stoltz said to me, “Jim this may not be significant, but knowing you and what I now about your family history, I think we need to get this checked a little further.” Onto the cardiologist, tests and then I had quadruple bypass and a new lease on life. During the entire process of operation and recovery, Dr. Stoltz remained close to us as our doctor, but just as important as a friend. He is bright, intuitive, well-educated and a caring human being who is a credit to the medical profession and our community. "Given the critical conditions of health care today with uncertain costs, inadequate services and limited access to good doctors, the practice of Dr. Rob Stoltz is a reliable, bright beacon of relief and exceptional care. It has been so comforting to me for many years knowing the medical and personal care we grew up with and covet today is still available right here in Lutherville. If you are seeking the best in primary health care, a patient friendly office with superb staff everywhere, you need to join the personal care medical practice of Dr. Rob Stoltz and get great medical care and peace of mind."